This floral tapestry "Sunlight Floral" is based on the work of Dutch master painter Jan Van Huysum from the 18th century. Van Huysum (1682-1749) was an artist from Amsterdam, son of floral painter Justus, who created floral and landscape works of remarkable beauty. Here we see a work which shows a vase of flowers on a table ledge. 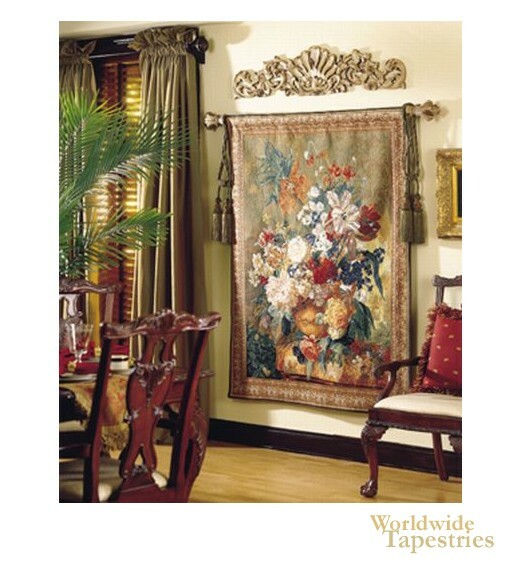 This Belgian tapestry "Salient Blooms Brown" is backed with a lining and has a tunnel for easy hanging. Note: tapestry rod, tassels and accessories, where pictured, are not included in the price. Dimensions: W 32" x H 42"
Dimensions: W 48" x H 64"